Preferred Woodworks | Custom cabinets and wood products | About Us. Former southern Minnesota farmer Bill Schmidt founded Preferred Woodworks, Inc.
Bill began acquiring heavy equipment giving Preferred the production capabilities. Phil founded Benjamin Robinson Woodcraft—named in honor of his father, and fellow woodworker, Robin Nesburg. Preferred Woodworks merged with Benjamin Robinson Woodcraft—now offer custom designed & built cabinets, furniture, and wood products along with manufacturing capabilities. We demand of ourselves the highest quality products on a consistent basis. Our craftsmen each have a minimum of 20 years of woodworking and cabinet building experience. This is reflected in the long-term relationships we have with our customers. We have been producing high quality products for some of our largest customers for 25 years! We understand that your unpredictable schedules and your customers’ ever-changing needs often put you in a crunch. We work flexible schedules to react to these needs. We also have an-open door policy with ALL of our customers. We recognize sometimes it is easier for you to show us how you would like something built, rather than to describe it over the phone or email. This fosters a cooperative creation process where our capabilities and your ideas meld. We treat our vendors, and employees with respect. We choose vendors who are locally owned and operated whenever possible. We understand and respect our vendors’ capabilities and their needs as a business. We consider our vendors partners. At Preferred Woodworks, our employees’ wellbeing is paramount. ALL of our employees make living wages and they are also given great flexibility to accommodate their personal needs and home life. Without them, we are nothing. Essentially, we’re a team of artisans with some really cool toys. Our craftspeople have each been woodworking for decades and have a passion for creativity. We take pride and ownership of every job we do. Stop into the shop anytime to meet us. We would love to show you what we can do! Phil’s life work is design and building of beautiful wood pieces. He was trained by generations of woodworkers and craftsmen. 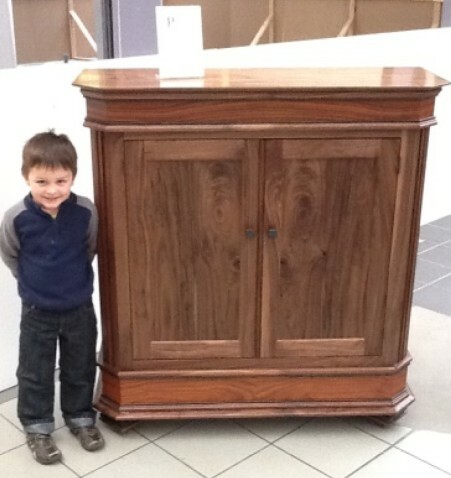 He built and showed his first table at the Renville County Fair at the age of 12 and has recently exhibited at the Northern Woods Woodworking Exhibition. Phil is also an accomplished product designer, combining function and beauty in all his pieces.